Greg Welch may be small in stature but his depth of athleticism was immeasurable. With a personality bigger than he was and an iron will to boot, Welch etched his name in the history books in not just one, but three ITU World Championship races across three different disciplines and distances. 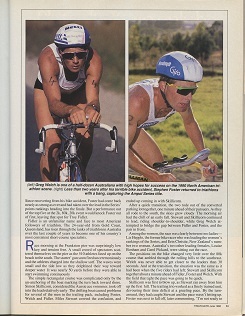 While rare to find an athlete that can garner success across various distances throughout their careers, “Welchy”, as he was known amongst the triathlon community, not only succeeded at both short and long distance races, but scored big results in both courses in the same season. It was as implausible then as it is now to flip flop between a “sprint” two hour event and laboring along in an eight hour one with the same successful outcomes. Just four years after he started the sport, he managed to score bronze at the 1989 IRONMAN World Championships in Kona, as well as competed at ITU’s inaugural World Championships in Avignon in a matter of months. The next year, Welch repeated the feat but upped the stakes, this time beating out a talented field that included Brad Beven, Simon Lessing and Mike Pigg to win his first ITU World Championships in Orlando. Incredibly, in just a matter of months, Welch also scored a top five finish in Kona. “I was the type of guy that went out after hours and did another 10km run because I was possessed. I just…I just wanted to train. I loved it. Adrenaline was my best friend,” Welch said in an interview on Enough Rope with Andrew Denton. And it was one that served him well. The following year, Welch sparked up the fast twitch fibers in ITU’s World Cup races to secure enough medals that he managed to finish as the circuit’s overall runner-up. 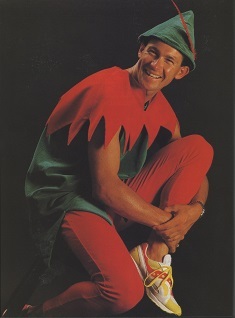 In preparation for another trip back to Hawaii, Welch traveled to Dallas for the 1993 Duathlon World Championships, where he won his second ITU championship title in as many multisports. Welch’s fun-loving attitude and predictable presence at the post-race party made his competitors think they had an edge, with Mark Allen once having said that Welch would have to “grow up before he could win” the big show in Hawaii. Welch answered the challenge by becoming the first non-American to win an IRONMAN World Championships in 1994 and went on to also win the 1996 Muncie ITU Long Distance World Championships. Following the third world title, Welch again defied odds when he returned to faster sprint courses on the ITU World Circuit and started cleaning up on younger, quicker fields in an attempt to qualify for the sport’s Olympic debut in his native Australia. While he was on track to achieve his Olympic dreams, life had other plans for him. Welch was diagnosed with Ventricular Tachycardia after suffering attacks while racing in Kona and was forced into an early retirement. “Put a tennis racquet, cricket bat, soccer ball, rugby league football, he loved it, ‘cause he kept moving. He was moving and never stopped. Until, unfortunately, he had to stop,” his father said in the Enough Rope with Andrew Denton interview. But true to his fighter spirit, Welch rebounded and repurposed his energy and unfathomable motivation back into the triathlon community as a coach and race commentator. Never far from the sport, he now has a prime seat to keep an eye on the next man who dares to equal his Grand Slam of titles.